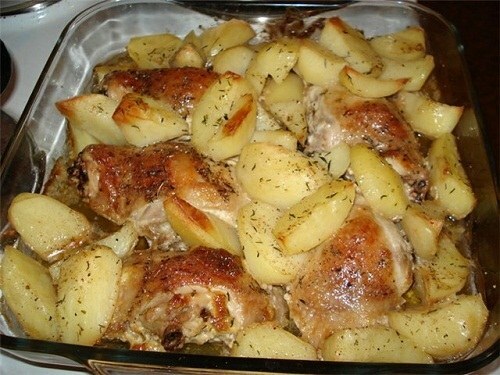 If you want to cook something delicious for dinner - bake in the oven chicken with potatoes. The recipe is very simple and does not require any expensive ingredients. Chicken will be tender and juicy, and as a garnish you can submit flavored potatoes with a ruddy crust. 2-3 sprigs of fresh parsley or dill. Peel one kilogram of medium-sized potatoes, and rinse under cold water. Cut each root into four pieces. In a deep Cup, mix 100 grams of 20% sour cream 3-4 cloves of garlic crushed in a garlic press, 1/4 teaspoon black pepper, ¼ teaspoon red pepper, 1 tea spoon of salt. Optionally, add there a couple of leaves of dried Basil, pre-crushing them with your fingers (it will give baked potatoes a nice flavor). Put the chopped potatoes in a Cup with sour cream and garlic mixture and thoroughly mix. The three middle legs gently rinse under running water. Divide each into two pieces (thigh and drumstick) and wipe them with a paper towel. RUB with salt and fry on both sides in a frying pan with vegetable oil until light Golden brown (about five minutes each side on high heat). In nonstick pan put chicken and potatoes. pour a little boiling water. Preheat to 180 degrees oven and put it to bake chicken legs with potatoes for 35-40 minutes. The first sign of cooked meals will be a pleasant garlic flavor. After cooking time, open oven and remove baking sheet. Pierce the meat with a toothpick or a thin knife, if released juice is clear - the meat is ready. Otherwise, put the baking tray for a further 7-10 minutes in the oven, reducing the temperature to 160 degrees. Put baked chicken legs and potatoes on a platter and serve sprinkled with chopped parsley or dill. As an additional side dish with chicken legs you can apply fresh vegetables and homemade pickles.